“The Trail of Diplomacy” is Odeen Ishmael’s illuminating, educational and exciting reading – vital to understanding international diplomacy as a mover of history. Author Odeen Ishmael’s contribution to international diplomacy and South American history comes in the form of a book on the Guyana-Venezuela border issue that started in 1840. Guyana today is much less powerful than its neighbor Venezuela, but not at the time of the boundary dispute. Guyana was then British Guiana, a colonial territory of Great Britain. 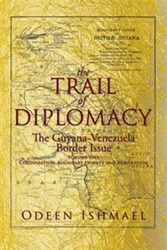 In “The Trail of Diplomacy,” Dr. Ishmael shows the behind the scenes diplomatic negotiations, the historical thrill of official documents and how they translate into history, and even intrigue on the international level, one that involved not only Venezuela, Guyana and Great Britain, but also the United States during the then penultimate arbitration in 1899. “The Trail of Diplomacy: The Guyana-Venezuela Border Issue,” the first volume of a three-part documentary of the Guyana-Venezuela border issue, gives a general overview of the early history of the colonization of the Essequibo region forming the large western part of Guyana. It presents the background to the origin of the territorial dispute which developed from 1840 and examines the opposing views of proposed boundary lines and the long trail of diplomatic exchanges between Venezuela and Great Britain. It concludes with the involvement of the United States in support of Venezuela, eventually leading to the international arbitration for a “full, perfect, and final settlement” and the arbitral award which delineated the territorial boundary in 1899. Odeen Ishamel’s book shows that history is an exciting and thrilling process as supported by diplomatic minutes. The trail of diplomacy is interwoven with the trail of espionage and international intrigue, and the trail of war and violence. In the boundary dispute between Guyana and Venezuela, it is “The Trail of Diplomacy” that prevails over sensitive events that continue to define a significant part of South America.